The act opens with a Grand Ball put on by Queen Saskia to celebrate the coming of age of her son, Prince Dietrich. Attending the Ball are the elite citizens of the principality, but one individual catches the Prince’s eye. Throughout the evening, the Prince and his new found interest exchange playful glances of interest and desire. In the moment, the Queen notices the exchanges and becomes somewhat alarmed by the prospects and forcefully introduces unknown princesses to the Prince in hopes of counteracting desires. The Ball begins to wind down with the departure of the Royal family. In the departure, the Prince and his love interest bid a hesitant farewell to each other all the while hoping that they would meet again. After the Ball, the Prince is elated of the possibilities of love and relives the moments of the Ball on his own while writing secret letters to his new lover. The Queen approaches the elated Prince and attempts to explain her disapproval. Ignoring her advice, he sets out to meet his new lover at the estate bridge hidden in the dark and mysterious forest. Opposite of each other, the Prince and his new lover approach the bridge. Eventually, the prospects are mutually accepted as they embrace each other in the middle of the bridge. The chime of the bell notes the Prince’s hastiness to get back to the palace without being noticed and they reluctantly part. In his happiness, his sister is magnetically drawn and begins to ask him questions of why he is so happy. The Prince tells her of the magical night, but the Queen confronts her son more emphatically about the situation. Fearful of what his mother might do, the Prince requests to meet his lover once again at the bridge. At the meeting, the Prince explains to his lover that they must keep their feelings silent, as his mother strongly disapproves of any sort of relationship they may have. They both know that this could be the last time they embrace. During their secret rendezvous, the Queen has secretly followed her son through the forest and lurks behind the trees. At the conclusion of the meeting, the Queen is beside herself with rage and begins to devise a plan to sever the undesired friendship all the while knowing that the Prince is her son and knows that she must tread very carefully as to not hurt him. Upon making a decision, Queen Saskia hatches a deceptive letter writing campaign. She begins writing false letters to Leofric pretending to be his lover. She also writes letters to Leofric's lover and sets up a false meeting between the pair. The Queen's letter campaign includes involving the lover's ex in hopes she can reignite their love, and make her son realize his new lover isn't the person for him. At the false meeting, the Prince's Lover arrives at the bridge where the pair first shared a special moment only to find their ex-lover desperate to reignite their relationship after being fooled by the Queen's letters. Leofric wanders onto the bridge and spots his lover's ex attempting to restore the passion they once had. Thinking the two are getting back together, he is crushed and rushes off to the palace where he locks himself in his room and mourns what he believed was his forever. The Queen returns from witnessing the false meeting and checks on her son for which he falls to her feet apologetically. Later that night, while the Prince is in his chamber, the Prince’s lover secretly climbs to meet with the him. Distraught and depressed, the Prince attempts to ignore his lover’s words until he explains that the Queen was behind the rendezvous. The expressions shift and the two spend the night together in passion. The next day, it is the night of the Full Moon; the Queen notices the return of her son’s happiness. Confused, she confronts her son about his change in mood. The two exchange words and the Prince forcefully points out that he knows that she was behind the false rendezvous. Admitting her complicity, she takes out her dagger in distress to end her life. While the Prince attempts to remove the dagger from the Queen's hand, in the chaos of the moment, she thrusts the dagger into the Prince but due to her distraught state, she thrusts it multiple times. The Prince finds himself grasping at life, while the Prince’s lover falls to their knees in despair as they peak around the corner. During the confrontation, the Prince’s sister is hidden within the room and watches as their mother ends her brother’s life and suddenly changes her views of the world around her. The act begins with the Prince struggling to stay alive. As each weakened breath is taken, his strength dwindles as the Celestial Court appears from the heavens to take the Prince to become the immortal Prince of the Blood Moons. The Queen, covered in her son’s blood, does not realize the harsh reality of the situation until she takes notice of the blood on her hands. She then switches her thoughts on the situation and begins to question her sanity. Apart from what has just occurred, the Prince’s sister, now seriously saddened, pays tribute to the death of her brother. The lover approaches the anguished sister and attempts to comfort them both on the loss of their beloved. Both are distraught about what has just happened. The lover, in his interaction with the sister, knows that a confrontation with the Queen is imminent and will surely result in the death of at least one of them. A few days after the death of the Prince, King Theodoric hosts a Grand Ball in honor of the death of his son. The Queen is not at all pleased with the notion but reluctantly attends. Also, invited is the lover who is seen by the Queen. Throughout the dances, the Queen tries not to come into contact with the lover knowing that she will have to answer to her crime. Eventually, they meet and the confrontation begins and it interrupts the party. Attempting to hush up the lover, she shows him the dagger that she used on the Prince and asks the lover to kill her. Instead, he wants her to stand for her crime before a court of ministers. However, in the struggle with the dagger, the Queen thrusts it into the lover and he is left dead as the party continues until the Prince’s sister finds them struggling for life. At the death of his lover, the Prince of the Blood Moons sends his Celestial Court to retrieve the body and bring it back to him. The ascension immortalizes the lover and the two are reunited again in love. The sister continues to show signs of deepening depression and as the years pass, the depression worsens no matter how hard the Queen tries to apologize for her insanity. She dances one last time to the memoriam of her brother and his lover. As she does, her emotions over take her and her heart weakens in her sadness and perishes. Her father, King Theodoric, holds her in his arms as the Prince comes to take her away to be with him in the heavens. Reluctantly letting her go, she and the Prince fade away as the Queen appears and the King looks at her in shame for the hatred and arrogance she has possessed. In the final moments of the ballet, the Prince, his lover, and sister are reunited leaving the Queen left to live out the rest of her years a lonely and poor soul never to find love again. 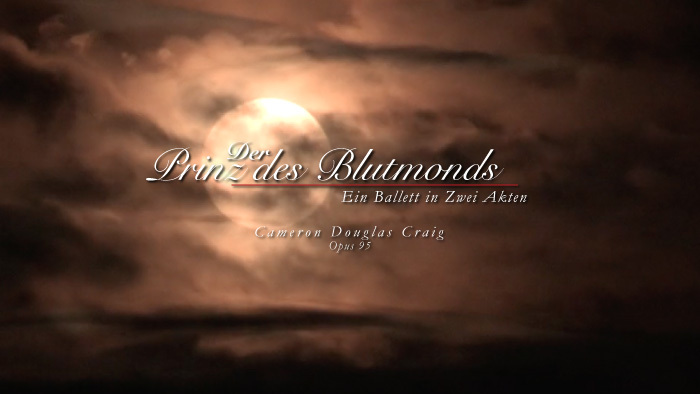 On 27 September 2015, Cameron Craig filmed the spectacular lunar event known as the "Blood Moon" and began to write the music for the short nature music video to feature on TCPFilms. After Craig completed the first twelve measures of the music, he began to envision a short animated film. Remembering one of his student's notebook of meteorological notes with impressive hand-drawn faces and various other doodles, Craig asked Travis White, a graphic arts major at Eastern Illinois University, if he would enjoy working on the short animation project. With a quick response, White was intrigued. The simple project would be no longer than four to six minutes long that would tell the story of the Blood Moon Prince, a fictional character from Craig's own mind. However, as Craig continued to work on composing the music for the short animated feature, he began to envision a more grand production in addition to the animation. Craig began to recall the short ballet, "The Rite of Spring" by Igor Stravinsky. "The Blood Moon Prince could be a ballet!" he said to himself. Craig began to come up with the storyline of a conceived German folklore that he titled, "Das Maschen und der Blutmond Prince (The Girl and the Blood Moon Prince)." The story involved a little girl that loved to dance and fell in love with the Blood Moon Prince that only appears every 18 years. Each time he appeared she would dance but age along the way until her death and, then, because she paid homage to him, she ascended to be with him for eternity. In order to fill in the story with a bit more depth, Craig called upon his broadcast meteorology student, Brian Hartman, who is well versed in storytelling and coming up with exciting plots. Hartman was excited to join the team and began to work on the one act plot. After two weeks, Craig finished composing the 33-minute single act. Satisfied with the work, he was unsure about the storyline. While driving back from his hometown and listening to the score in his car, Craig began to wonder about a few things; 1) who was this Prince; 2) how did he become the Blood Moon Prince; and 3) where is the intrigue? Craig called Hartman and White to meet in his office in the Geography department later that evening to rework the storyline into two acts with the finished act as the second act. Within an hour, Hartman came up with a plot that changed the whole scope of the ballet. Not to give anything away, the production involves love, passion, jealousy, and murder. Hartman went as far as to research the names of the characters as to their meaning to the plot. On February 7, 2016 Craig finished the score for the complete 1 hour and 53 minute ballet. The team will begin to package the ballet to send out to contacts to find a choreographer. Fundraising will be the next step in putting the production on track for a performance in the future. Continue to watch this site for updates on the production. Artistic Design Copyright 2016 by Travis Dean White.